TMA members now have access to affordable security risk assessments. Automated cyber and HIPAA compliance software that does not require you to be an expert. Takes less than 3 hours to complete the assessment. Reduces your risk of a breach. Prioritized corrective actions provided in Cyber Compass™. Start with an easy to complete security risk assessment to gauge where your organization currently stands. Autogenerated simple step by step prioritized remediation action guides to harden systems and engage employees. Complete on-demand tool with reporting, dashboard, storage and Business Associates agreement management. Most healthcare practices do not use any integrated software to manage cyber risk and compliance. 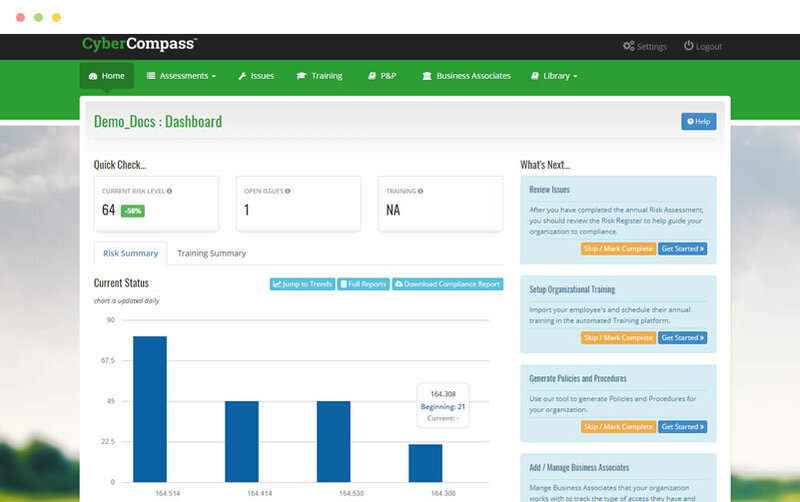 Cyber Compass™ is an affordable “best in class” solution enabling pre-breach protection and compliance in as little as 90 days for your organization. Cyber Compass™ is approved by Texas Medical Association, Texas Medical Liability Trust and endorsed by Texas Health Services Authority. Get started now to see how we can help you build a culture of cyber resilience. Get started with CyberCompass™ today! For hands-on assistance with completing your self-assessment, contact TMA Practice Consulting. Small to medium size healthcare practices are the number one targets for cyber crime. An average breach can cost over $900,000. The complexity of HIPAA and cyber security makes most of healthcare providers want to put their heads in the sand. Often, they lure themselves into the myth “IT has it handled” or “My EHR has my HIPAA covered. Our experience shows EHRs do not meet all HIPAA requirements plus 67% of breaches are employee related. So you need to think beyond just anti-virus for your cyber protection.